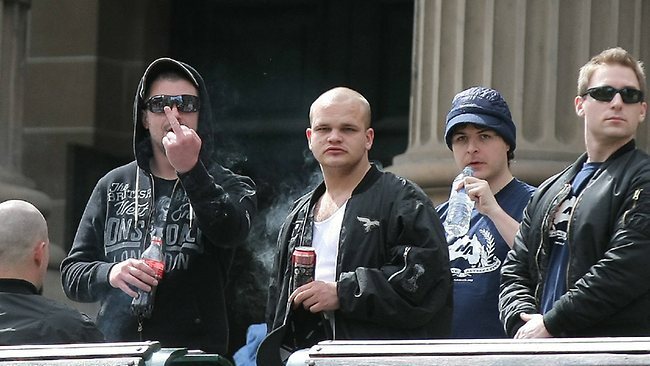 A handful of neo-Nazis and some other White racial patriots attended the State Library today in order to prevent local Muslims from waging jihad on bad television. “The group of men, some of them wearing T-shirts bearing SS insignia and some with shaved heads, denied being part of any organisation. Apart from being rather amusing, this response is also rather disingenuous. Thus the t-shirts — as photographed by news.com.au — contain images of the logo of ‘Nationalist Alternative’, a tiny neo-Nazi grouplet from Melbourne. Notably, one of NAlt’s very first forays into local politics took place in Williamstown in 2008, when the group allied itself with locals in order to oppose the construction of a mosque. In general, however, NAlt may be viewed as the successor organisation to Dr Jim Saleam’s ‘National Action’. Of course (after a spell in prison for trying to terrorise an opponent) Saleam is now the leader of the Australia First Party, which earlier this month won a place on Penrith council. As for NAlt Saleam has previously dismissed them as a bunch of students from Melbourne; on the other hand, Dr Jim also referred to the Hammerkins — which gained some fame last month after one of its members shot dead six Sikhs at a temple in Wisconsin — as merely the organisers of musical events for young people… though these ugly faces don’t appear to be very studious. Secondly, the man on the right bears an uncanny resemblance to local neo-Nazi organiser Jack/Gareth Sansom — whose political perspective is straightforwardly and unapologetically nazi — and there were a small number of other known faces in attendance. In summary, then, apart from the handful of older neo-Nazis, the small crowd appears to have mostly consisted of flag-waving White teenyboppers — the dregs of the Southern Cross Soldiers, perhaps, or some other, more recent derivation — alongside a handful of elderly atheists. The Herald Sun has published a gallery of images of the teenage soldiers and the atheists here. This entry was posted in Anti-fascism, State / Politics and tagged Gareth Sansom, Jack Sansom, Nationalist Alternative. Bookmark the permalink. Saleam made a post on Stormfront indicating that the Australia First Party will be supporting a council candidate in Maribyrnong, John Carbonari will be running in Stony Creek ward, no doubt these Nationalist Alternative guys will be all over it. Saleam also posted a while back that there would be an “announcement” involving Australia First and Nationalist Alternative, this might have been what he was referring to. The Stormfronters are at present arguing over the weekend’s “Rally” but according to the Nationalist Alternative supporters they received a message of support from Dr Jim and Australia First.